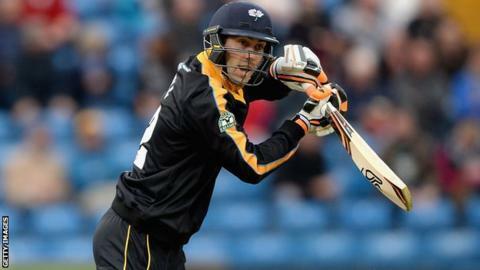 Australia all-rounder Glenn Maxwell was dropped for Yorkshire's final T20 Blast group game on Friday against Birmingham Bears for disciplinary reasons. The 26-year-old agreed to extend his contract with the county earlier this month after compatriot Aaron Finch was ruled out for the rest of the season. But he was absent from the team as they beat the Bears by eight wickets. "It was just unprofessional behaviour and I don't wish to add anything further," said coach Jason Gillespie. "It has been dealt with and we have moved on and the slate is clean. As soon as the decision was made, we cracked on." Earlier this season, fast bowler Liam Plunkett was dropped by the club for missing a training session and photocall. Maxwell has played 12 T20 games for the Vikings this summer, scoring 229 runs and taking 12 wickets. An agreement was reached for him to miss the Australia A tour to India to stay with the county and he will now be available for the One-Day Cup and County Championship as well.